Looking for a Secure Smartphone? 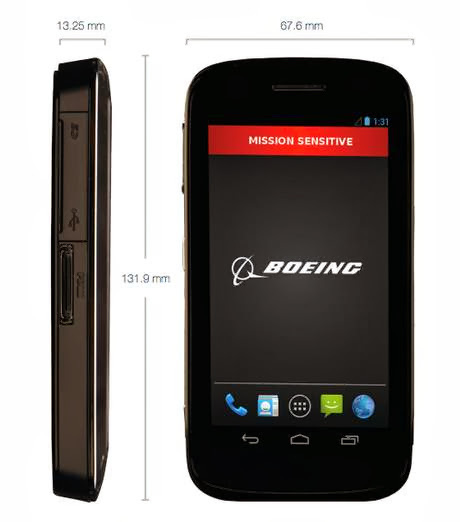 World's biggest Aerospace company - Boeing is finally close to the launch of its high-security Android Smartphone, called "Boeing Black (H8V-BLK1)", primarily designed for secure communication between Governmental agencies and their contractors. Encrypted email, Secure Instant Messaging and Other privacy services and tools are booming in the wake of the National Security Agency’s recently revealed surveillance programs. Encryption isn’t meant to keep hackers out, but when it’s designed and implemented correctly, it alters the way messages look. Boeing is the company which is already providing secure communications for US Government officials, including the president. Don't mess with it, It can Self-Destruct: Boeing Black Smartphone can Self-Destruct if it is tampered with, destroying all the data on it. The device is delivered in complete sealed form, any attempt to open the seal of the device will destruct the operating system and functionality of the device. “Any attempt to break open the casing of the device would trigger functions that would delete the data and software contained within the device and make the device inoperable,” says the paperwork. Well, another important fact to be noticed, Boeing Black (H8V-BLK1) won't be available to average consumers, it is designed for Governmental agencies, Defense and Homeland security only. Ultra-Secure Mobile Operating System: Boeing's modified Android operating system has a specific software security policy configuration, so users can configure the device for maximum mission productivity and security. "Boeing Black’s security is powered by the Boeing PureSecure architecture, which was designed from the outset for the mobile environment. Our architectural foundation is built upon layers of trust from embedded hardware, operating system policy controls, and compatibility with leading mobile device management systems. The device’s hardware roots of trust and trusted boot ensure the device starts in a trusted state, enabling the maximum security of data. Hardware media encryption and configurable inhibit controls are embedded to protect the device, its data, and the transmission of information, significantly reducing the risk of mission compromise due to data loss." according to the paperwork they filed with the Federal Communication Commission (FCC). Boeing Black supports dual MicroSIM with GSM, WCDMA, and LTE on a wide range of bands to facilitate global use and operates on the modified version of Android Operating, that keeps all details as secure as possible. Security and Confidentiality of the information of any person related to the National Security must be on the high priority, but problem arises when the NSA like agencies starts capturing the Data flowing on the backbone of the communication channel and Bribes Software companies to weaken the encryption, and that compels a user to think twice before opting the new inventions and products. At the Mobile World Congress in Barcelona, Washington-based software firm Silent Circle and Madrid-based Geeksphone teamed up to launch the Blackphone, highly secure device that doesn't run on any traditional telecom carriers or operating systems. We have reported earlier, there is another interesting Self-destructing Chips project, that has been handed over to IBM by the Defense Advance Research Projects Agency (DARPA).